Create the Life You Want! These, are (as the title says) my “best” meatballs—they’re light, tender and bursting with flavor. When wanting tender, juicy meatball it’s important to remember two things: handle the meat mixture with kindness and simmer them very (very) gently, as aggressive handling and/or cooking will toughen them. The only exception to this is while browning the meatballs–which is done with the sole purpose of searing the surface. No need to get carried away with this part since browning them on “all” sides is nearly impossible and would risk overcooking them at this initial stage. This recipe is purposely large because meatballs freeze perfectly. You can, if you wish, halve the recipe. 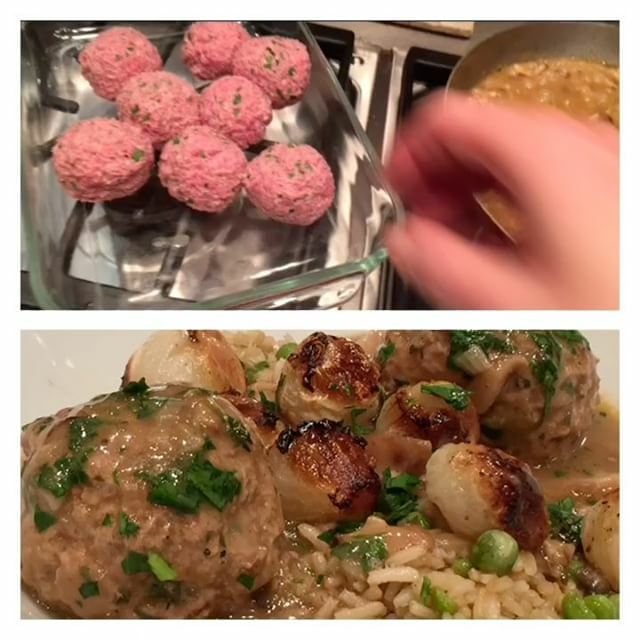 To read my blog, which has many step-by-step instructions (along with the story of how come making great meatballs is so important to me) click here. Any time I’ve suggested a tool, a piece of equipment, or a culinary term that’s unfamiliar to you, you can go to Learn to Cook for more information. Put the cubed bread in a bowl and add the milk. Use your hands to help the bread absorb the milk. Set aside. Put the eggs, onion, garlic, pesto, ½ cup Parmesan and a generous amount of freshly ground black pepper into the blender. Puree until smooth. Put the ground meat into a large (preferably wide) bowl and pour the pureed mixture on top of the meat. Add the moistened bread cubes, as well, and using your hands, work everything into the meat, using a tender hand—you’re not squeezing or kneading the meat aggressively—which can toughen the meat. Just use your hands to fold the two consistencies together, turning this into one mixture. Line two large shallow baking sheets (or trays) with wax paper and then sprinkle the paper generously with more grated Parmesan. Use your working hand to scoop up some of the meat mixture (mine are the size of a small soft-ball). Gently round the shape by rolling the meat mixture between two hands. Lay the round on the cheese-lined tray and continue until you’ve finished shaping all the meatballs, dividing them between both trays. Then, one by one, roll each meatball in the cheese, then round the shape again, helping the cheese to adhere. When all the meatballs are coated with the cheese, cover the sheets with plastic wrap and refrigerate for at least 30 minutes (and up to several hours). Bring the marinara sauce to a simmer in a 10-quart heavy bottomed saucepan, over low-heat, with the lid ajar. Remove the meatballs from the refrigerator. Turn off the heat and add more black pepper, some minced raw garlic and more fresh basil, to taste, then shimmy the pot to distribute things. Take the pot off the stove. If not serving right away, allow the meatballs to cool in the sauce (uncovered). Divide the meatballs in plastic tubs. If you’d like to serve some and store the rest, transfer the meatballs and sauce you’d like to serve into another pot. Place the rest into a freezer container and attach a label with the contents and date. Freeze. To thaw, remove from the freezer and leave in the refrigerator overnight. Reheat the meatballs, covered, over very low heat, shimmying the pot as needed, to help things heat evenly. Serve when piping hot throughout. If you're interested in one of my services, or you'd just like to reach out about a recipe or an ongoing struggle in your life, please do so. I read each and every message personally. As an Amazon Associate, I earn money from qualifying purchases.